Great Lakes Border Collie Rescue has earned a reputation in the rescue community for taking dogs that other rescues won't consider: older dogs, sick dogs, mixed-breeds. We enjoy this reputation for one reason: we've always gone the extra mile and stretched a bit further. Bingo was a Border Collie in Indiana whose owner contacted us on the suggestion of her local Animal Control Officer. 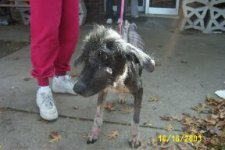 Because of Bingo's reported hair loss, it was feared he might have mange, a highly contagious condition to which we wouldn't want to expose our other dogs and which we might not have the funds to treat. 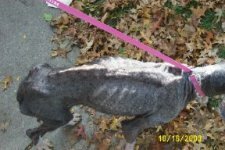 Nonetheless, a few of our members quietly worked with an Indiana all-breed rescue to get Bingo a vet evaluation, so we could at least determine if we might be able to help. The sight awaiting us was unimaginable. 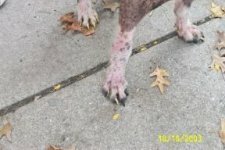 He was emaciated & hairless, he had deep sores under his eyes from abscessed teeth, and his nails were so long he could barely walk. The vet provided immediate supportive care, but his poor weakened body could not withstand even the most minor procedures. The only relief clinicians could provide were intravenous fluids and hot water bottles for his aching body. Bingo died three and a half days later. He died alone in a steel cage, in the early morning before the clinicians arrived. We will never know if we could have saved Bingo if we'd had the means to get him out of his hell a few days sooner. We will forever be haunted by the fact that his frail body just shut down, before he could know even a few days of attention and kindness. In Bingo's memory, we have started an emergency fund solely to provide immediate veterinary care for high risk dogs. We couldn't act soon enough for Bingo. We lost him not for lack of effort, nor for lack of will, but for lack of funds, and that's just not acceptable.